This may be my best bag yet! 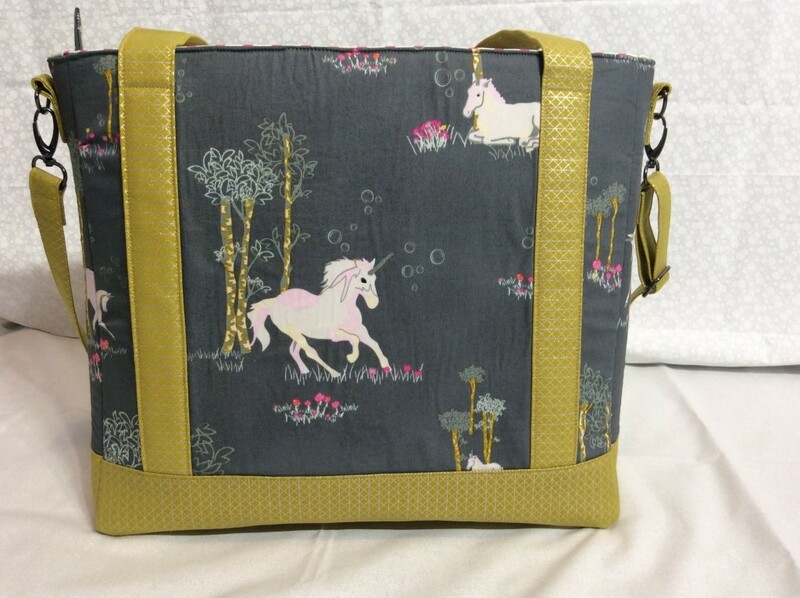 I just finished making the Tudor Bag from a Sew Sweetness pattern – using mostly Sara Lawson’s new Fantasia line for Art Gallery Fabrics, plus a little C + S Basics Netorious Goldilocks and Silver. 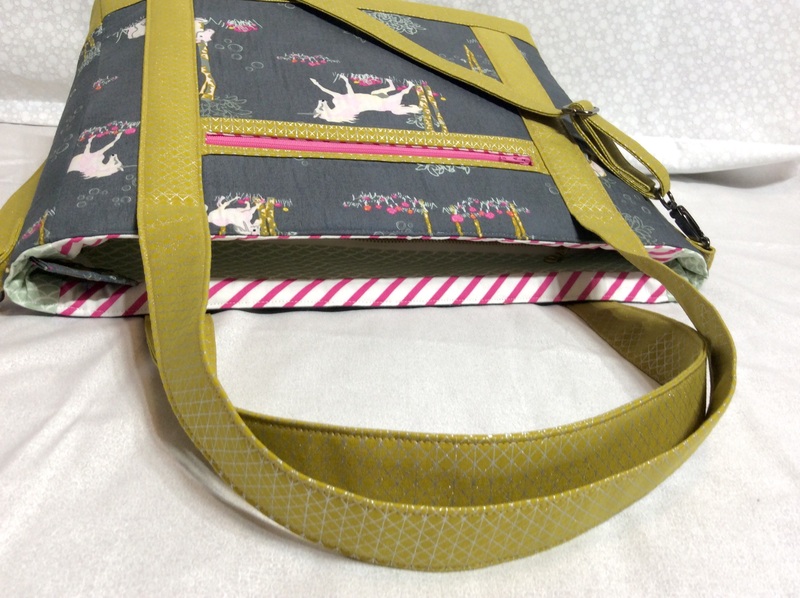 As I mentioned in my last post, I wanted to use fabric designed by Sara to make one of her signature bags. I am totally in love with this one! Total time to make the Tudor Bag from start to finish: approximately 18 hours. At least six of those hours were spent ironing, cutting out fabric and interfacing, and then fusing interfacing. Another 6.5 hours dedicated to basting exterior fabric to the foam interfacing, adding the zippered front pocket, sewing all of the elements to the exterior panels, making and attaching the zipper closure to the top, and attaching the slip pockets to the lining. An estimated hour and a half on making the straps, and about four hours on actual construction. For interfacing I did use Pellon SF 101 and substituted Bosal In-R-Form Sew in Foam Stabilizer in place of Annie’s Soft & Stable. 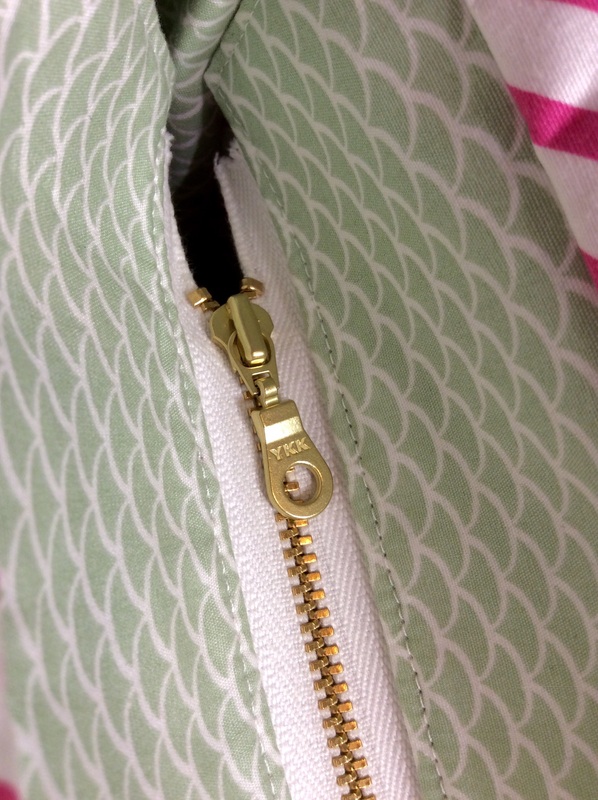 This was my first experience adding a zipper tab to the inside of a bag, and it was easier than I expected. The pattern is recommended for a “confident beginner” and I found that categorization to be accurate. While it’s not a quick sew, it can be completed over a weekend if you cut and fuse the pattern pieces beforehand. 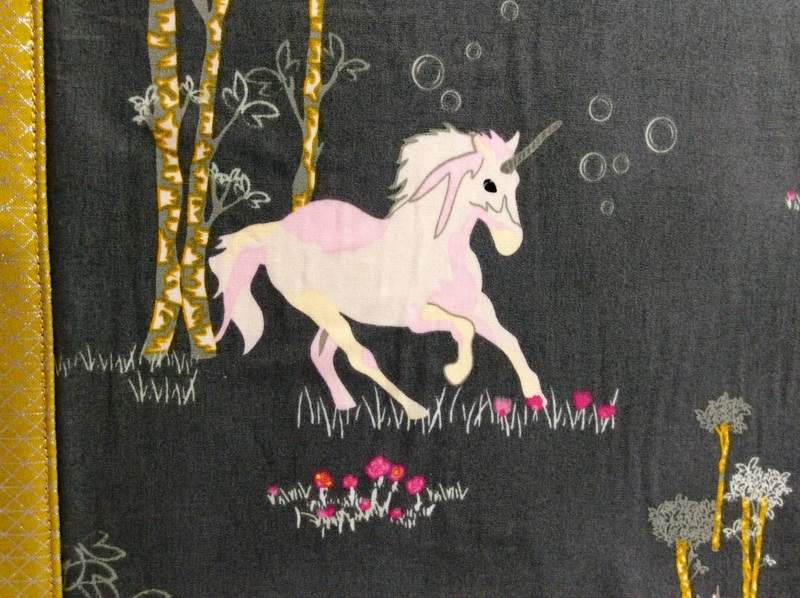 This Unicorn Fable Sageplant print is so gorgeous I just can’t get over it! 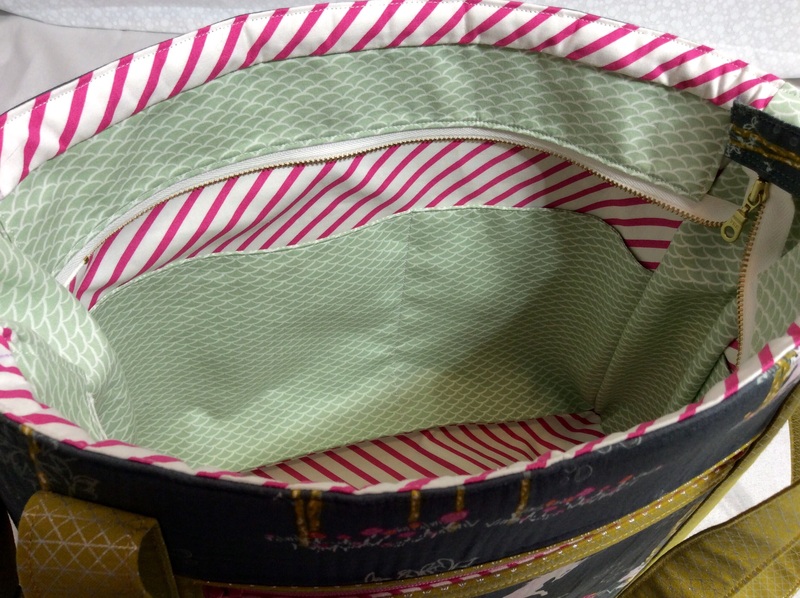 Inside, I mixed up the fabrics and used both Monokeros Stripe Candy and Miniature Hills Dew. 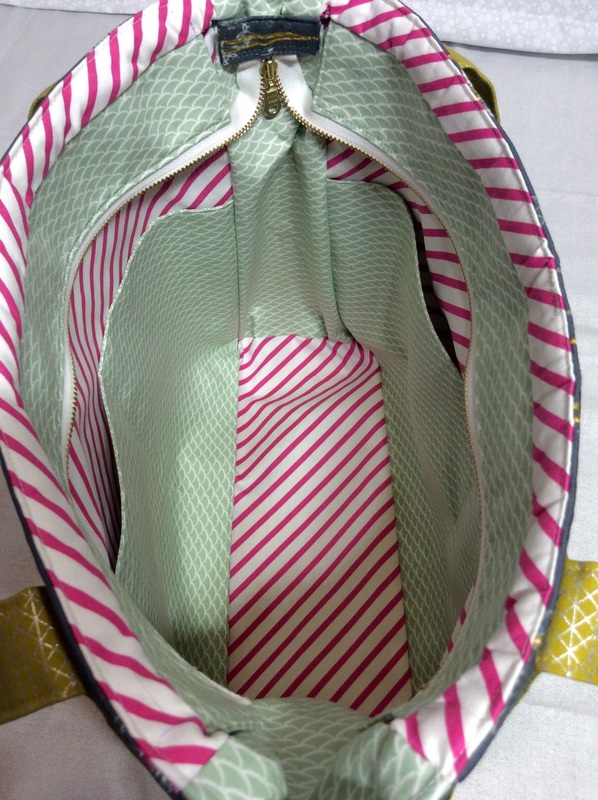 Both sides feature two interior slip pockets for lots of separate storage. This was one of the easiest to follow bag patterns I have tried, and also one of the *least* frustrating to construct. Of course, I am trying to find any excuse to use these beautiful gold zippers I ordered on Etsy in as many projects as possible. One step that I did alter for ease was making the strap tabs on the side panels. The pattern instructed me to sew the long sides of very small pieces of fabric together and turn it inside out. This just didn’t work for me, and I even tried to use a large safety pin – but it just frayed the fabric and ruined my first pieces. They were just too small for me to turn. Instead, I marked lines 1/4 inch in on each long side, pressed the fabric toward the wrong side at that point, then put two pieces wrong sides together and stitched close to each edge – eliminating the need to turn them. 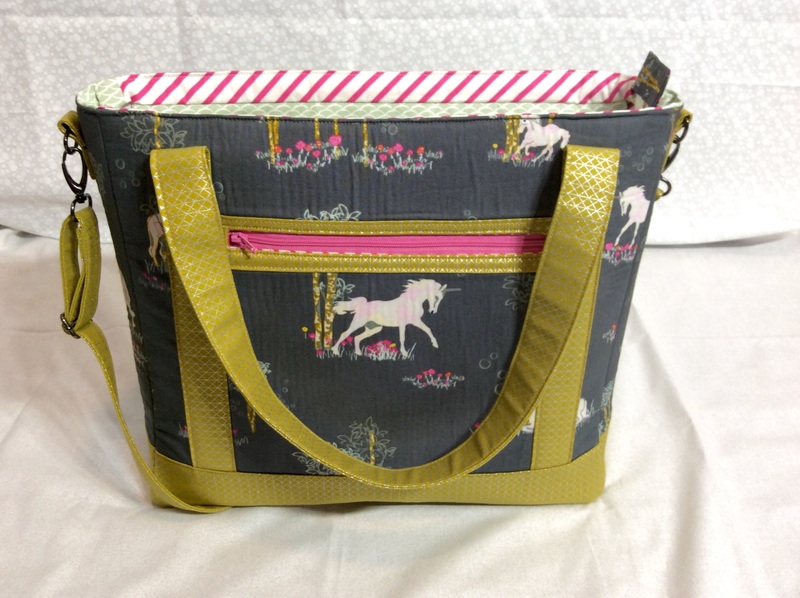 The front zippered pocket option really ups the fun factor and practicality of the bag. Since I have had practice adding them before, it was not difficult for me this time around. 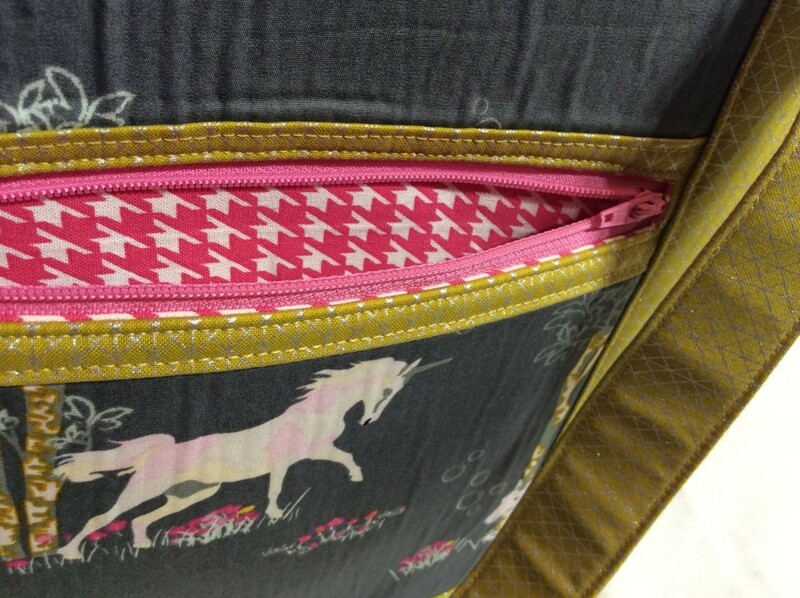 The interior pocket fabric is a pink houndstooth print scored for $1.99 a yard on Cyber Monday. Ever since I learned to glue baste, I have been using every available opportunity to put this into practice. This was no exception. I glue basted the straps before topstitching (so they were even), the straps to the exterior panels, the accent pieces, the front zippered pocket, the slip pockets to the lining, etc… Glue basting has really done a lot for my accuracy in sewing and quilting. It’s at least as fast, if not faster than pinning – plus you don’t have to worry about the indents in the fabric made by pins. Compared to both the Aeroplane Bag and Cargo Duffle Bag I have previously reviewed, the Tudor Bag is definitely more simple in design and not as challenging. Sara’s tips and methods for construction are very clear and worked well for me. 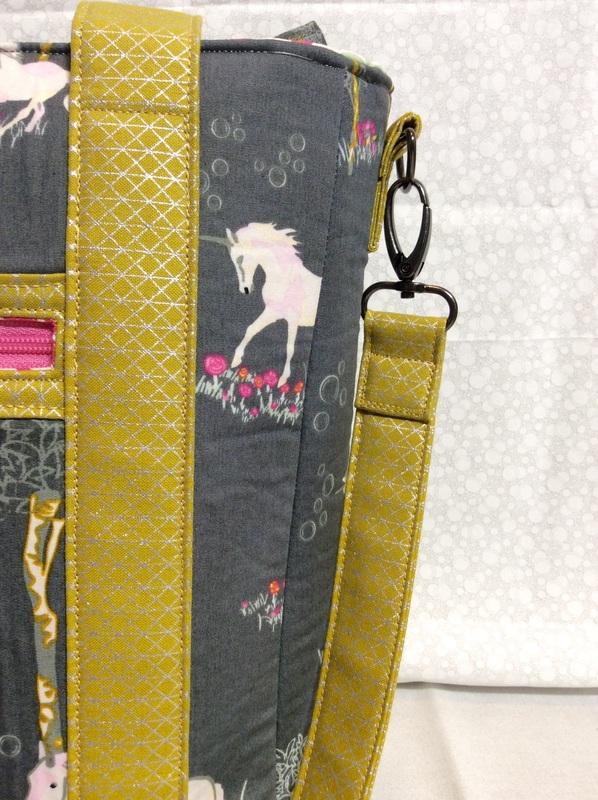 I was surprised at how professionally made my bag looks, and found this pattern to be a confidence booster! The final verdict? The Tudor Bag is, without question, Moore Approved! 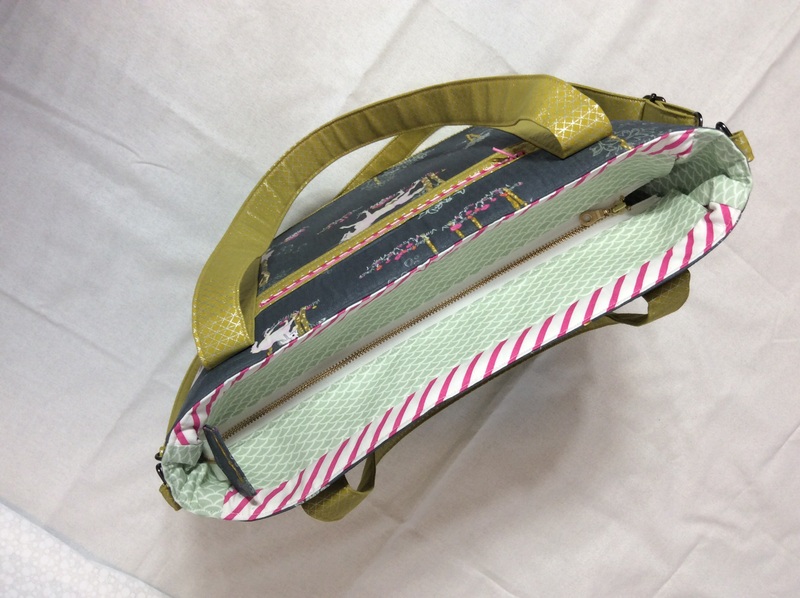 The finished size is 13.5 inches long by 12.5 inches tall, and 5 inches deep – perfect for use as an everyday purse. 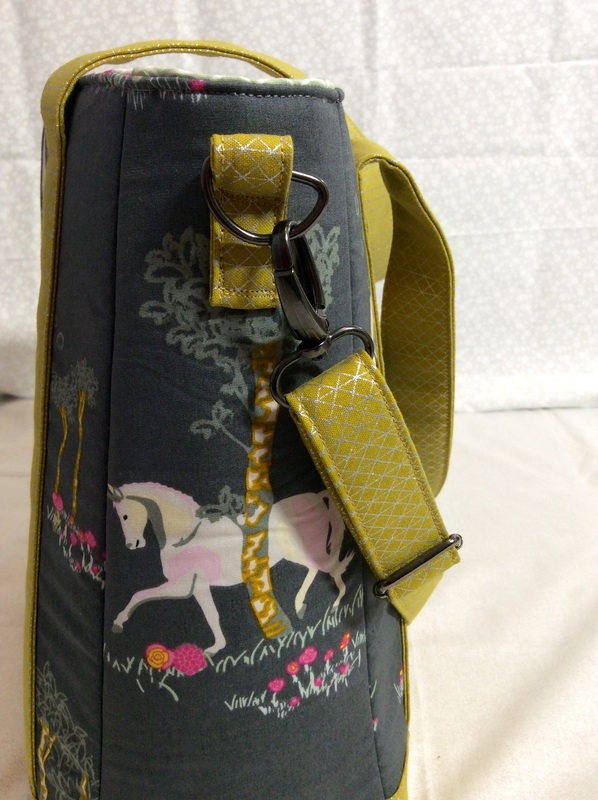 It offers several different optional features (front zippered pocket, zipper closure vs. magnetic snaps, shoulder strap, and metal feet) so you can truly make a custom piece. 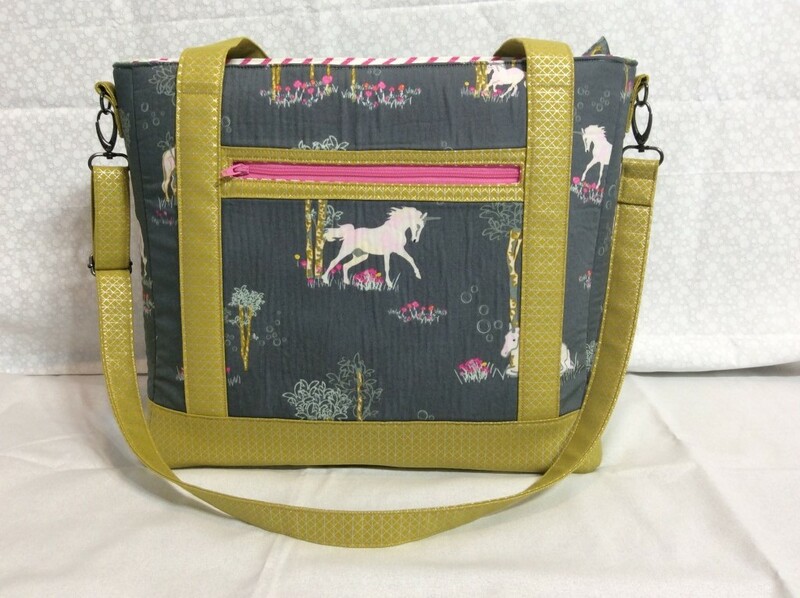 Beyond just a pattern, the construction methods Sara teaches can be easily transferred to other bag patterns or in a design you create yourself. Once you know the basic concept for bag features – it isn’t difficult to replicate them for another project. 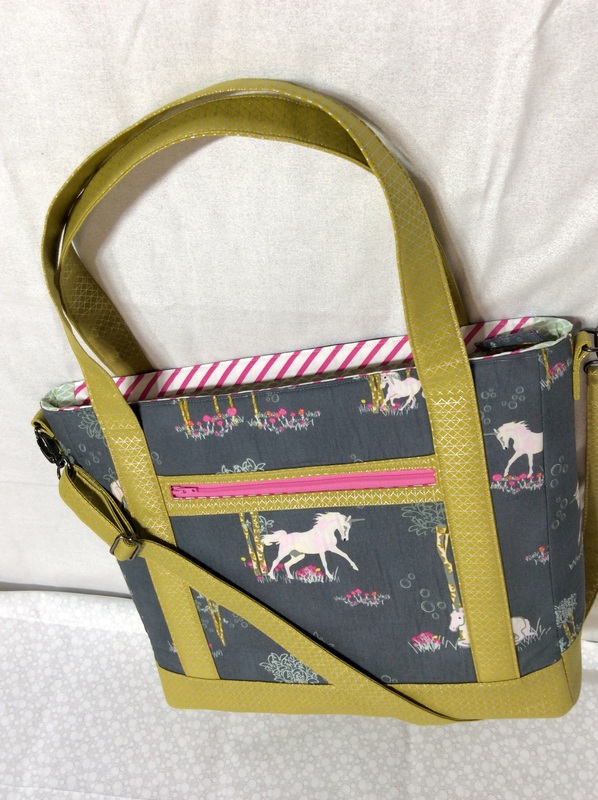 2 Responses to "Pattern Review: Sew Sweetness Tudor Bag"
This is so amazing! 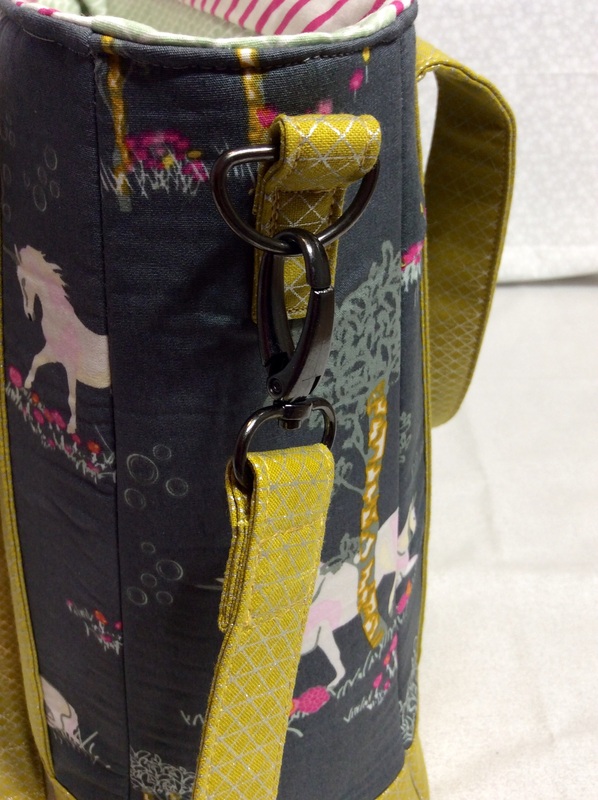 Thank you so much for combining my fabric and pattern…it’s gorgeous and I love it so much!!! Sara – both the fabric and pattern are a dream! Thank you for your wonderful designs! 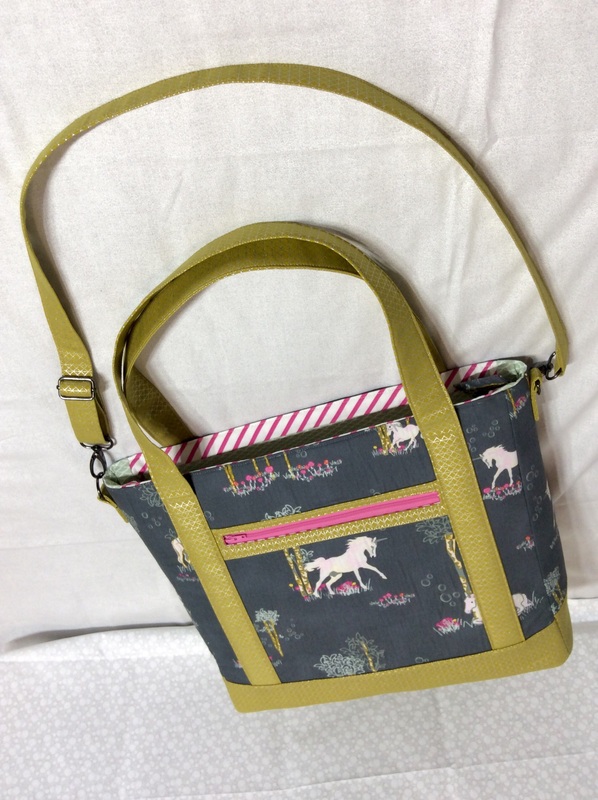 Already several people have said they want the bag – not sure I’d be able to part with it!